What we call “Veterans Day” in the USA is known as “Remembrance Day” in Australia. Whatever they’re remembering, we’ve apparently forgotten. The end of the “war to end all wars” ? Maybe. The 11th hour of the 11th day of the 11th month of 1918 was supposed to usher in permanent peace…but somehow instead it led to Orwellian dictatorship under an empire of permanent war. Maybe all those 11s were Satanic illuminati signposts pointing down the road to dystopia? 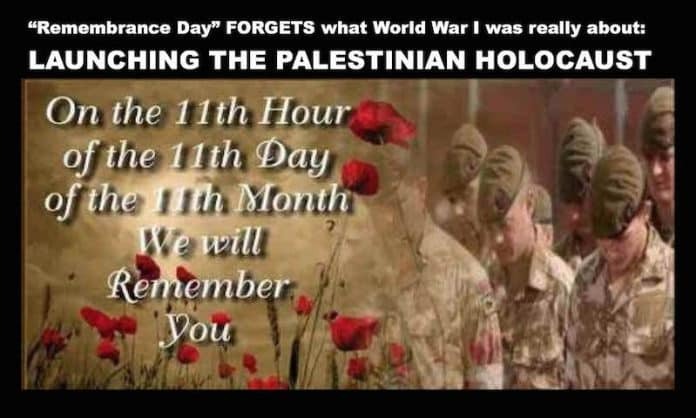 Down under, where they celebrate Remembrance Day but probably don’t remember much of what World War I was really about, my favorite Jewish truth jihadi Aussie, Dr. Gideon Polya, just sent out the following. Time for me to shut up and give him the last word. WW1 ended on 11 November 1918 but there is relentless continuation of the Palestinian Genocide that commenced with the WW1 British invasion of Palestine (since then there have been 2.3 million Palestinian deaths from violence, 0.1 million, or imposed deprivation, 2.2 million). Violent killing of Palestinians commenced with the Surafend Massacre on 10 December 1918 in which about 100 Palestinian villagers were massacred by Australian soldiers. There is a huge irony associated with Remembrance Day observance in Australia that commemorates those brave Australians who mistakenly fought for the genocidally racist British Empire in WW1. Thus on Remembrance Day 1975 reformist Australian Labor Prime Minister Gough Whitlam, a WW2 air force veteran who was opposed to the Vietnam War and ended Australia’s involvement in that atrocity, was removed from office in a US CIA-backed Coup. Eminent expatriate Australian journalist John Pilger has described the 1975 Coup as “The forgotten coup – how America and Britain crushed the government of their “ally” Australia”. 11 November 2018 (Remembrance Day) marks the centenary of the signing of the Armistice that brought the carnage of WW1 to an end. This important centenary will be commemorated in countries that were former British allies in WW1 (UK, US, Canada, Australia, New Zealand, France, Belgiumand Russia) and in the opposing countries of Germany and of the Austro-Hungarian Empire. Prominent in the commemorations will be the modern equivalents of the mendacious politicians, journalists and jingoists who were criminally responsible for WW1 (20 million killed), the so-called war to end all wars, that inexorably led to WW2 (100 million killed) and the post-WW2 US world war on humanity that in the 21st century has focused into a US War on Muslims (over 32 million dead from violence, 5 million, or from deprivation, 28 million, since 9-11) (see Gideon Polya, “ Jingoistic Perversion Of 1918 WW1 Armistice Centenary – Humanity Ignored Yields Genocidal History Repeated”, Countercurrents, 10 November 2018“).